Excellent location. View of the marina from our patio was beautiful. Staff were extremely accommodating and helpful. Would definitely stay again. Mountain Marina is a very nice place but our experience from the apartment we occupied was very bad as cleaning was not properly done, we ran out of toilet papers at some point and had to ask them from the duty Manager. The smell from the bathroom was so unbearable and the urinals that are installed probably are making the apartments to smell very bad. Everything was fantastic from the arrival up to the point we left. The housekeeping was spot on and on daily basis. The management was outstanding and always available to help. Great location, wonderful views, very spacious, super safe, amazing interior design. Great position. Nice size bedrooms. Good verandah. Facilities in complex are awesome. Lovely place in a great area, close to food market, shopping centres, aquarium and tourist office. Staff is very professional and friendly. Highly recommended! Beautiful location - easy access to the Waterfront, a lovely walk! And we loved the outdoor heated pool!! Perfect location for the purpose of our visit. Beautiful views. Units were serviced daily. Lock in a great price for Mountain Marina Luxury Apartments – rated 9.1 by recent guests! Mountain Marina Luxury Apartments This rating is a reflection of how the property compares to the industry standard when it comes to price, facilities and services available. It's based on a self-evaluation by the property. Use this rating to help choose your stay! 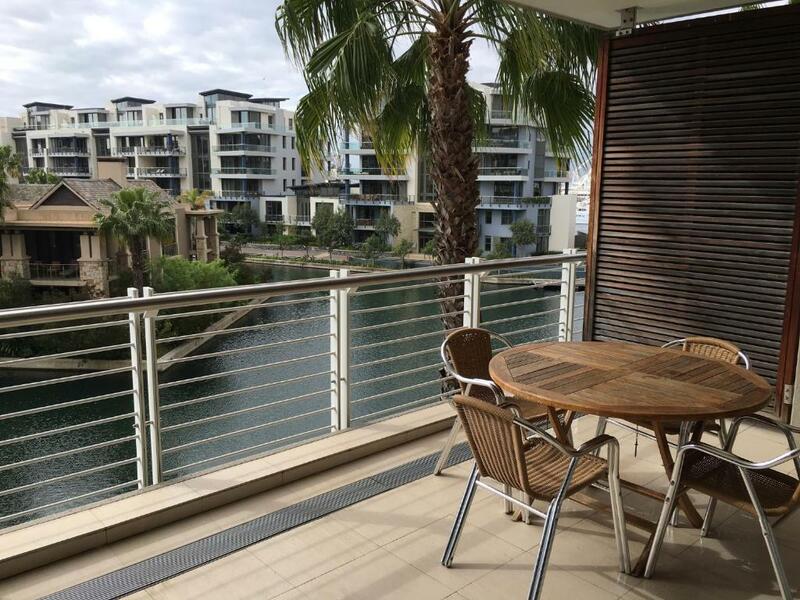 One of our top picks in Cape Town.Mountain Marina Luxury Apartments, located in the Victoria and Alfred Waterfront, Cape Town features views overlooking the yacht basin in the V&A Waterfront Marina Residential. The apartments have access to 3 swimming pools. 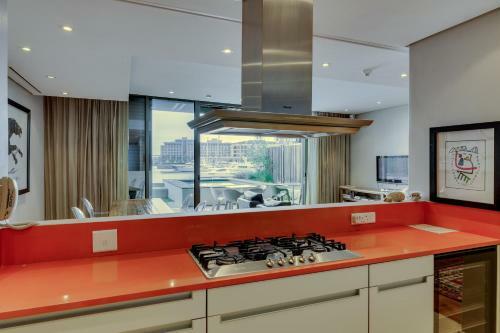 Each modern luxury apartment comes equipped with a designer kitchen, a separate lounge and dining area and satellite TV. Free toiletries are provided in the bathrooms. A private chef can be arranged to prepare meals for guests in the privacy of their apartment. A number of restaurants serving a range of local and international cuisines can be found within 0.6 mi. Laundry and dry cleaning services are available. For relaxation, guests can arrange to have an aromatherapy treatment or massage in their apartment. A gym is on site an can be used for a fee. WiFi and private underground parking is available. Guests can make use of the airport transfer and chauffeur service available. Cape Town International Airport is a 20-minute drive away, while Cape Town International Convention Center (CTICC) is 0.7 mi away. When would you like to stay at Mountain Marina Luxury Apartments? This air-conditioned apartment includes a fully equipped designer kitchen, a dining area and a lounge with a flat-screen satellite TV. The private bathroom includes a bath and free toiletries are provided. Some of these apartments have a private pool. This air-conditioned apartment includes a fully equipped kitchen and a lounge with a flat-screen satellite TV. The private bathroom includes a bath and shower and free toiletries are provided. The private bathroom includes a bath or shower and free toiletries are provided. This air-conditioned three-bedroom apartment features a spacious balcony with views of the marina. It has an open-plan living area with a fully-equipped kitchen, including a washing machine and a tumble dryer. Two bedrooms are en suite, and there is an additional bathroom. Free toiletries are provided. This luxury penthouse apartment has a private plunge pool and a furnished balcony overlooking the yacht marina. It has an open plan living and dining area, a fully-equipped kitchen and 4 bathrooms with free toiletries. Please note, children cannot be accommodated in this apartment. The team at Mountain Marina is led by the owner himself and consists of a small team with focus on personalised service and aspire to meet our guests every need. Guests can learn from us about seeing the alternative side of Cape Town from a local's point of view and take part in adventurous activities from Hiking Table Mountain to surfing the best beaches or even diving with great white sharks ! Mountain Marina is located within the V & A Waterfront and is a 5 minute walk to the Mall with all it's Restaurants and Shops. The beaches are a quick 10 minute cab ride away and the world-class wines and the restaurants of the Wine-lands a relaxing 30 minute drive. Boat trips leave from just outside the Marina and sunset cruises to the Beaches of Clifton are an unforgettable experience ! Area Info – This neighborhood is a great choice for travelers interested in shopping, wine and restaurants – Check location Excellent location – show map Guests loved walking around the neighborhood! House Rules Mountain Marina Luxury Apartments takes special requests – add in the next step! All children under 16 years are charged ZAR 570 per night for extra beds. Any additional older children or adults are charged ZAR 570 per night for extra beds. Mountain Marina Luxury Apartments accepts these cards and reserves the right to temporarily hold an amount prior to arrival. Please note that 2 GB of WiFi is free of charge, thereafter charges apply. Please inform Mountain Marina Luxury Apartments of your expected arrival time in advance. You can use the Special Requests box when booking, or contact the property directly using the contact details in your confirmation. DSTV decoder wasn't working. White towels were stained and smelled musty. Received a speeding fine of R500, yes was informed about 20km/hr speed limit, however received a call and fine issued for my son with no evidence given, accept a phone call to say we received one. Very long list of rules to abide by including noise levels however across the road builders were pounding foundation whole day long, which was heard all day long. Feel for what paid for, there are so many rules that you are too scared to do anything in case you do something wrong. Being a Cape Town resident, we were not even allowed a visitor. 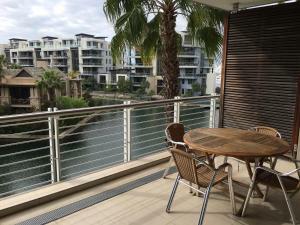 Apartment was spacious and clean, great views and near to Waterfront. Boat building immediately in front of the apartment was a serious invasion of privacy. Should NEVER be condoned. En suite bathroom is not separated from the bedroom... Not ideal! Bit slow to respond to issues. What we got just wqsnt inline with what was charged... other simikar properties at skmilar price deliver way more. Friendly staff, and great location. Units are spacious. Daily cleaning service. Even on public holiday. That was fantastic!! Dimming lights was a nice touch as well. Everything was excellent. Can’t complain about anything really. We were received very well and my partner and I were given each a key. The staff was very efficient in responding to emergencies.